the Spirit is given for some benefit. Have you ever wondered why you, a family member, friend, co-worker or fellow parishioner reacts or does things in a certain way? Do you question the mystery of who you really are? Living Your Strengths has been developed to assist Catholic faith community members to ascertain their God-given talents so that each talent can be used in service and growth in their faith community. To date, over 200 parishioners have taken the on-line assessment, and more than 100 people have taken the workshops. If you would like to learn your top 5 God-given talents, please contact the parish office to obtain your copy of Living Your Strengths. With this book you obtain an access code that enables you to take a twenty-minute on-line assessment. Following that, you will learn your top five God-given talents. Our goal is to help our faith community to become more engaging, which follows a deeply spiritual path of recognizing God's grace in our midst. Building engagement will help to draw people towards Christ. It is a complex, dynamic and wonderful ministry to share with each other. Workshops are offered in our parish to all those who have taken this online assessment. They help you learn about your own and other parishioners' talents in greater depth and in a spirit of gratitude for God's blessings. Other activities are offered in the parish to encourage parishioners to continue to explore and develop their gifts. If you have completed the strengths workshops, and wonder what is next, consider one on one coaching with Diana Bruce, who has received training as a Gallup Faith Strengths Advisor. This allows her to assist those of us who have completed the workshops, to take this journey to the next level. Those who have been “coached,” have indicated that they have been able to use their talents more effectively, to the point where their talents grow toward becoming strengths, and their personal and spiritual lives have been enriched. How does the coaching work? It involves a 45-60minute interview/conversation exploring your signature themes. A plan is put in place to assist you in using your talents by applying them to a specific goal to intentionally improve upon what you already do well, as well as using your talents to do those tasks that bog you down or that you dislike doing. Your coach will do a follow-up a few weeks later, to help you evaluate your plan. Sessions may then be continued on a long term or short term basis, as requested. Further details and questions can be addressed to Diana Bruce at 876-1104. Getting clarity about the unique nature of my soul can help me find my best way to fulfill my chosen roles and to meet my chosen goals. Our next Strengths workshops will be November 1st, 8th,15th and 22nd on Wednesday evenings, 7-9 pm at SMB Meeting Room #2. The 4 sessions are fun, relaxed and an informative way to understand more deeply our God-given talents and help us discern ways to develop these talents into strengths. Registration is limited to 6 participants. 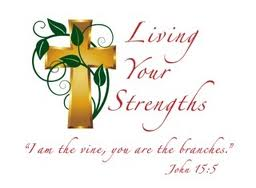 To register or for more information and/or receive a copy of Living Your Strengths, please contact the parish office. The workshops are a fun, relaxed, and yet informative way to understand more deeply your top 5 God-given talents which you have learned through the Living your Strengths assessment. The knowledge of these talents is a wonderful key to help you discern where God may be calling you to help you to find greater fulfillment in your personal relationships, your work and your life within the Church. The format of the workshops is a small group discussion of 6 participants, with exercises and reflections to help you begin to realize the unique potential that God has planted within you and the others in the group. Please consider joining us for these workshops--enrollment is limited to 6 participants. To register or for more information, please contact the Parish Office.